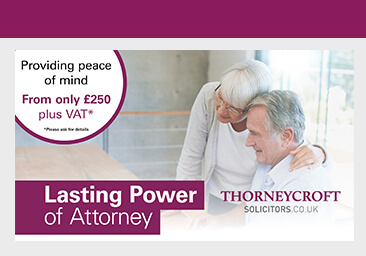 Thorneycroft Solicitors, based in Macclesfield, Buxton, Holmes Chapel and Whaley Bridge have an expert team of Wills, Trust and Probate solicitors who specialise in advising on and providing Lasting Powers of Attorney. We provide our clients with a sensitive and sympathetic service and will guide you through the process from start to finish. Our team is led by a member of STEP (Society of Trust and Estate Practitioners) who can act as a professional Attorney if required. Many of us may think that we’re either “too young”, “nothing is going to happen to me” or that “I will address this at a later stage”, however we all know someone who has memory problems, suffered a serious accident or a rapid deterioration in health. Should this happen and you’re unable to manage your own affairs, it may be too late to appoint an Attorney under a Lasting Power of Attorney and your affairs will be dealt with by the Court of Protection. What is the Lasting Power of Attorney process? A Lasting Power of Attorney is a legal document by which you can appoint another person to make decisions for you, should you become incapable for any reason. This gives you, your family and loved ones the peace of mind that all matters will be dealt with in your best interests, by someone who you know and trust should anything unfortunate happen to you. With a Health and Welfare LPA you can choose in advance who will be authorised to make decisions on your behalf, relating to your health and welfare in the event of you losing the capacity to make decisions. Control over your affairs would only pass to the person that you have nominated as your attorney at such a time when you have lost mental capacity. Health and Welfare LPA’s are often required when decisions are needed to consent to medical treatment and to organise residential care. With a Property and Financial Affairs LPA you can choose someone to manage your financial affairs. Unlike a Health and Welfare LPA, where the attorney can only be authorised to exercise his or her powers after you lose mental capacity, a Property and Financial Affairs attorney can be authorised to act on your behalf whilst you still have capacity, for example during extended periods abroad. We have put together an Estate Planning Checklist to help you plan for the future. It is worth taking the time now to discuss what options are available to you to give you peace of mind and reassurance that your affairs will be well looked after should anything happen to you. If you would like to know more, or would like to book an initial FREE consultation simply contact our expert LPA solicitors. We are happy to arrange to visit you at home.